Hospital wastes have always been considered as potentially hazardous in view of the inherent potential for dissemination of infection. The major identified hazard was that of infection, because over millennia communicable diseases had been the most common cause of morbidity and mortality in the community and majority of persons receiving treatment in the hospitals were suffering from communicable diseases. Disinfecting right at source and disposal by incineration, which completely destroys micro-organism of all types, has been the time tested and most widely advocated method for safe management of hospital waste. In this background in persuasion to the directive of The Court, the Ministry of Environment and Forests, Government of India notified the Bio-Medical Waste (management and Handling) Rule on 27th July 1998; under the provision of Environment Protection Act 1986. Accordingly all the hospitals in the public and private sector are now bound to follow these rules to evade legal action. It regulated the disposal of biomedical wastes and lays down the procedures for collection treatment and disposal and standards to be complied with. These rules apply to all persons, who generate, collect, receive store, transport, and treat or handle biomedical wastes in any form. Biomedical wastes mean any waste, which is generated during the diagnosis, treatment or immunization of human beings or animals or in research activities etc. According to Bio-Medical Waste (Management and Handling) Rule – 1998, all the bio-medical waste shall be treated and disposed according to the rule with the help of requisite bio-medical waste treatment facilities like incinerator, autoclave, microwave system for the treatment of waste, or, ensure requisite treatment of waste at a common waste treatment facility or any other waste treatment facility. It is a well-known fact that establishment of such facility individually is beyond the capacity of even small or medium hospitals and nursing homes. Further, it appears cost effective to establish one large facility, rather than establishing multiple small facilities. Under such situation, Indira Gandhi Institute of Medical Sciences – Patna has come out with a proposal to establish a Comprehensive Hospital Waste Management System in accordance with the provisions made in the Bio-Medical Waste (Management and Handling) Rule – 1998 for the care of hospital waste generated by Hospital / Nursing Home etc. operating from Patna municipal area as well as neighboring districts for treatment. 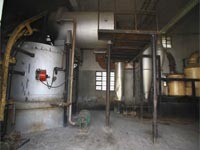 With the financial assistance from Government of India, INCINERATOR SYSTEM (CAPACITY: (200 - 250) Kgs/hr. ); AUTO CLAVE SYSTEM (CAPACITY: 1000 Ltrs). ; HEAVY DUTY SHREDDER (CAPACITY: 100 Kgs./hr. ); EFFLUENT TREATMENT PLANT ; BLODD BAG DESTROYERS; NEEDLE SYRING DESTROYERS etc. has been installed and operative since June – 2006. 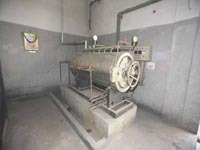 The specially designed Incinerator System installed at Indira Gandhi Institute of Medical Sciences – Patna is one of its kind in the whole state of Bihar. 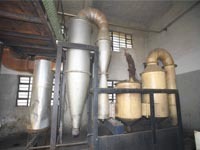 It can incinerate waste at the rate of 200 to 205 Kgs. Per hours with combustion efficiency of 99%. 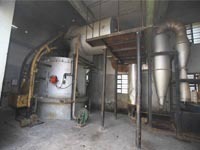 It comprises primary and secondary chambers for burning of solids. The temperature of the primary chamber will be approx. 850°C and the secondary chamber temperature will be approx. 1050°C at the time of operation. The temperature recorder (Graphically) is attached to monitor the temperature during the process. The height of the stack is above 30 meters from ground for safe emission of gas residuals. The pollution control device is also attached with the system to achieve emission standards as prescribed in Bio-Medical Waste (Management and Handling) Rule – 1998. The Incinerator is being fired by low sulphur diesel. The authorization for Collection, Reception, Storage, Transportation, Treatment and Disposal of bio-medical waste under Bio-Medical Waste (Management and Handling Rule), 1998) has been obtained from Bihar State Pollution Control Board – Patna. 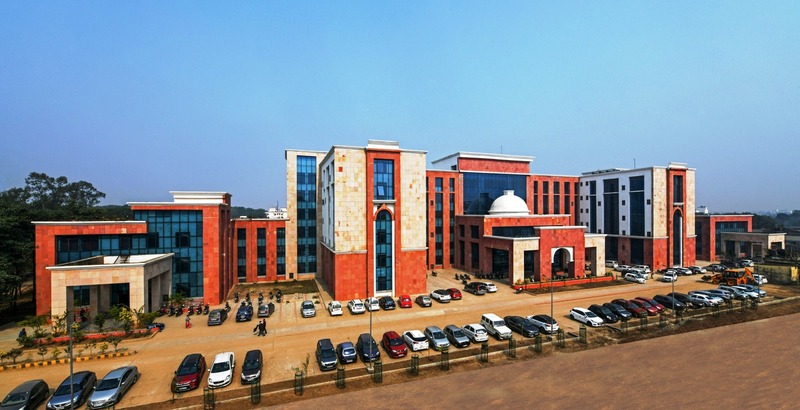 The complete Hospital Waste Management System installed at Indira Gandhi Institute of Medical Sciences – Patna was designed in such a way that it can provide treatment of bio-medical waste generated by Hospital / Nursing Home / Pathological Centre etc. operating in Patna district as well as adjoining areas. The I.G.I.M.S. has made the arrangement to collect the bio-medical waste from Hospital / Nursing home / Pathological Centre /Diagnostic Centre / Blood bank / OPD Centre / Vet. Centre & Lab etc. at their premises every day. For above, all the Hospital / Nursing Home / Pathological Laboratory / Diagnostic Centre / Blood bank / OPD Centre / Vet. Centre & Lab etc. will seal the bio-medical waste in prescribed bags according to Bio-Medical Waste (Management & Handling Rule) – 1998 and kept at the designated point in their premises. The facility charges for the transportation, segregation and disposal of bio-medical waste of various customers (Private / Government Health facilitites) registered with “INSTITUTE” for Patna District will be Rs.5:60 (Rs. Five & Paise Sixty Only) per bed per day irrespective of occupancy. In case, where bed system is not defined, the facility charges shall be Rs. 18: 75/- (Rs. Eighteen & Paise Seventy-Five Only) per Kg. per day. Hospital / Nursing home / Pathological Centre /Diagnostic Centre / Blood bank / OPD Centre / Vet. Centre & Lab etc. interested to avail these facility is required to be registered them with Indira Gandhi Institute of Medical Sciences – Patna. The Registration Form is available at official website of the Institute (www.igims.org).